It’s time for another blog from our wine expert, Neil Hodgson, this week he’s talking blended red wines. Often the combination of two things is greater than the individual parts and in the case of some red wines this is certainly the case. I am not sure I would like a blend of Chardonnay and Cabernet Sauvignon, it would just be wrong; but, if you combine Cabernet Sauvignon with, say, Merlot, the results can be astounding. Blending wine varieties to make a finished product has been done for centuries. Bordeaux wines, for example, are blended wines; the grape varieties producers can grow and use is strictly controlled, but they are blended wines. Rather than producing individual varietal wines, they produce a regional wine style, called Bordeaux. In New Zealand and Australia some of the greatest wines are made from a blend of different grape varieties, but why? It’s quite simple… Each variety has distinct flavours and characters, and when these are combined each variety adds something to the mix. Take a Cabernet Sauvignon/Merlot blend, for example. Cabernet brings flavour and dry, astringent tannin texture to the party, while Merlot brings plush fruit flavours and soft tannins. Combined the result is a wine with gentle tannin structure, fresh, almost minty flavours, all wrapped around plush ripe fruit flavours from the Merlot. Of course, there are many other blending options that are temendously successful and when winemakers get the balance between the flavours and structural component supplied by each variety just right, the results are delicious wines. 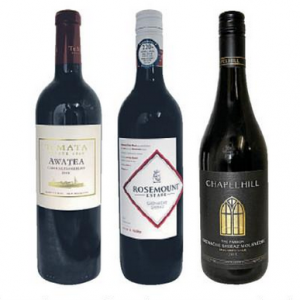 At Fresh Choice Nelson, you’ll find some excellent blended red wines to enjoy this winter, covering a whole price range. Try the $10 juicy Australian Grenache Shiraz or maybe the sophisticated Hawkes Bay Te Mata 2015 Awatea Cabernet Sauvignon Merlot for $36.99. There are plenty more blended red wines to choose from, for every taste and budget.